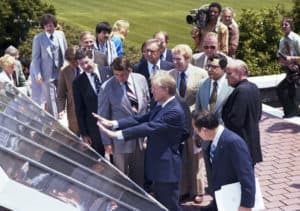 In 1979, Jimmy Carter had 32 solar hot water panels installed on the White House to heat water for the family as well as the laundry and cafeteria. His successor, Ronald Reagan, was not a fan of solar and later had them removed. Solar power returned to the White House when President George Bush had them installed on the cabana roof to heat their pool. President Barack Obama then had photovoltaic solar panels installed in 2014. These panels are six times more powerful than the panels installed in 1979. Back in October, Jimmy Carter leased 10 acres of land to provide solar power to his hometown of Plains, Georgia. Earlier this month, Carter unveiled 3,852 photovoltaic solar panels that are estimated to produce more than 50% of the power the small town consumes regularly.